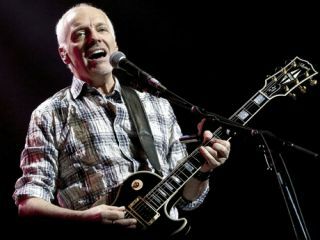 Guitarist Peter Frampton is recovering from a car accident that occurred on a Southern California freeway yesterday (31 July), one which left him with back and neck pains, and he puts the blame squarely on a texting driver. "Texting woman driver just ran into back of me while I was stationary in traffic 101 freeway," he tweeted at 5:45pm PST. "Can u say whiplash? People put the phones down!" Several minutes later, he tweeted, "Back and neck not good. Going to ER after my flight today." It should be noted that texting while driving is banned in the state of California. In addition, drivers are forbidden to read texts and engage in other smartphone-related activities while behind the wheel. Frampton is set to a tour on 3 August in Otsego, Minnesota, and from all accounts, he'll be there. Late last night, he took to Twitter and wrote, "I'm 'Grinning and Bearing' the tour already and it hasn't even started yet! Ouch!! Ha ha ha ha..."